In the past few years, much of the new releases from Avo Cigars have been built around the annual limited edition releases. However, it sometimes is easy to forget that Avo Cigars’ has a pretty solid core line. 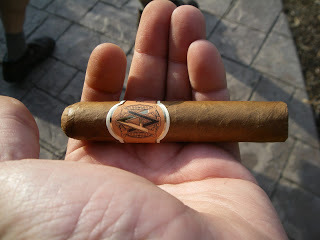 In this assessment we go back and explore one a cigar blend that has been a part of the Avo Cigars family for a long time. This cigar is known as the Avo XO. In particular we will take a look at the Avo XO Presto – a small panatela/corona size vitola. Overall, I found this small cigar to provide a nice smoking experience when you need a quick smoke without too much power. One trend that I think will continue in 2012 is the push/return to many smaller sized cigars. While much of this had to do with providing short, quick smokes during the winter months, I also see this as a trend that will continue for the remainder of the year. In the case of the Avo XO Presto, this is a smaller size that has been around for some time. It fits the bill for short, quick smoke any time of the year, but probably best suited as a first smoke of the day. The wrapper of the Avo XO Presto has a caramel/brown color to it. I would not categorize the wrapper as either oily or silky. For a small vitola, I was surprised that it was more on the smooth side and not very bumpy. There are also very few veins or visible wrapper seams. The band is orange, black, gold, and ivory. It features the traditional Avo logo on an orange background. To the left and the right of that Avo logo is the text “Avo XO” in black font. For my Avo XO Presto, I placed a straight cut into the cap. When I started with the pre-light draw I detected notes of cedar. The cedar notes had more of a sweet taste as opposed to a spice taste. I also detected some notes of caramel. I wondered if the power of suggestion was playing a role here on my pallet because I had been intrigued with the caramel colored wrapper. Overall, I thought the pre-light was satisfactory, so it was time to light up my Avo XO Presto and see what it would bring to the table. Upon lighting my Avo XO Presto, I was treated to some more of the cedar sweetness I had detected on the pre-light draw. I also detected some secondary notes of nuts and cream. The cedar sweetness soon took on some spice qualities and became more of a “sweet spice”. The sweet spice, nut, and cream notes were pretty much the flavors that would be present from start to finish. Toward the later part of the smoke, the Avo XO Presto’s spice seemed to overtake the sweetness as far as the sweet spice went. There was some spice as the cigar experience concluded, but it was not overwhelming. The resulting nub was soft to the touch, but cool in temperature. From the standpoint of the construction attributes of burn and draw, the Avo XO Presto scored extremely well. The burn line was razor sharp from start to finish – requiring less than a handful of touch-ups with my butane lighter. The burn rate and burn temperature were ideal from start to finish. As for the draw, it scored perfectly – making the Avo XO Presto a great cigar to puff on. In general, Avo Cigars are not going to overpower you with strength and body. With the case of the Avo XO Presto, this is not going to be a nicotine bomb. The Avo XO Presto is going to be a classic mild strength cigar. As for the depth of the flavor notes, this has just enough to be considered medium-bodied. The flavors are definitely going to have the edge when it comes to the balance of strength and body. I believe the Avo XO Presto falls into the category of a quick, morning smoke. From this standpoint, this cigar succeeds in meeting its objectives. For a novice cigar enthusiast, this not only makes a good quick morning smoke, but it is a nice cigar to get someone started on. It provides a flavor without the strength – and doesn’t take a lot of time to smoke. Experienced cigar enthusiasts will probably only gravitate to this if they want that quick, morning smoke – and are fine without having the strength. While I prefer a little more strength, and more complexity, this cigar can do the job for me – and I would smoke it again. Source: The cigar for this assessment was a promotional item from an Avo Cigars’ event at Casa de Montecristo in Countryside, Illinois. « Cigar Review: CAO Last Stick Standing (LSS): O	» Press Release: Merlion by La Sirena Coming Ashore!